darc room : live stream lecture programme to take place at the Nicholls & Clarke Building on 19th – 20th September as part of darc room, London Design Festival’s lighting destination. The darc room : live programme of live stream lectures has been announced. Featuring 38 speakers over the two days of the darc room exhibition, darc room : live is a series of quick-fire, 15-minute talks by leading lighting industry professionals. Curated by creative consultants and lighting designers Light Collective, darc room : live will be able to be viewed live at darc room and on Light Collective’s YouTube channel, Light Collective TV. Speakers include Keith Bradshaw, Speirs + Major; artist Liz West; Paul Traynor, Light Bureau; Cinzia Moretti, British Institute of Interior Design; Peter Fordham, DHA Designs; Inessa Demidova, Arup; Jonathan Rush, Hoare Lea; Marci Song, SEAM; Ben Rigby, Haberdashery, Monique Tollgard, Staffan Tollgard Design Group; and Chiara Carucci, Tengbom. 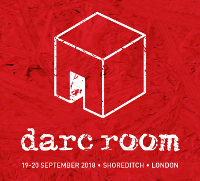 darc room is London Design Festival’s lighting destination and features 50 exhibitors, 38 live stream talks and 8 workshops – all in a creative space with a unique exhibiting concept. Exhibitors at darc room 2018 so far include AC Lighting, Aion LED, Applelec, Art et Floritude, AxaLight, Casambi, Coelux, Delta Light, EcoSense, Elumeros, Erco, ES-System, Exenia, Feelux, Forge Europe, Formalighting, LED BCN, LED Ltd, LED Linear, LensVector, LightGraphix, Lightly Tech, Ligman, Linea Light Group, Lite, Lumenpulse Group, MP Lighting, Nicolaudie, Osram, Pro LED, Pulsar, Radiant, SAAS, SGM, Targetti, tossB, Traxon, Tryka, Whitegoods and Zico Lighting.